The mandate of the College is to regulate the professions of Audiology and Speech-Language Pathology. The College serves and protects the public interest, and governs its members in accordance with provincial government legislation, the Regulated Health Professions Act, 1991 (RHPA), and the Audiology and Speech-Language Pathology Act, 1991(ASLPA) and the regulations, policies and by-laws of the College. The College is responsible for protecting the public’s right to the provision of safe, quality services from audiologists and speech-language pathologists. This is accomplished by providing oversight and education to our members, reviewing their skills and knowledge on a regular basis and addressing formal complaints and reports from the public and employers. Providing accessible complaint and discipline processes for people who feel that the standards have not been met by an audiologist or speech-language pathologist. The Council is composed of nine elected professional members, two members from the University community, and up to seven public members appointed by the provincial government. Who are CASLPO’s members? Ontario’s audiologists and speech-language pathologies must be annually registered or ‘licensed’ by the College to be authorized to practice in Ontario. Patients must be able to put their trust in those who treat them. The College is dedicated to supporting its over 4,000 audiologist and speech-language pathologist members in their delivery of quality care. “Trust Matters” Poster. 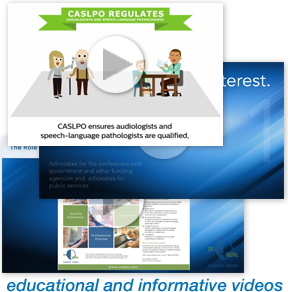 Find a regulated Audiologist or Speech-Language Pathologist and identify whether they are authorized to practice, and whether there are any restrictions on their practice. Throughout CASLPO’s 2017 Annual Report, are indicators of progress and accomplishments of our work. CHCH-TV Health and wellness segment developed for “We Mean Business” Answers to questions about access to audiology and speech-language services and the importance of seeing a professional regulated by CASLPO.